Sometimes, a crash is so terrible that a permanent memorial is created. Other times, family and friends will erect a temporary memorial with flowers, pictures and religious symbols. When a bicyclist is slain in a crash, advocates such as Danny Gamboa, Aktive, the Eastside Riders, and Los Ryderz, the city’s bicycle co-ops or any number of people or groups may chain up a haunting white “ghost bike” at the crash site. How a city should respond to roadside memorials for pedestrians, car passengers and cyclists killed in crashes has been a difficult question. How long is too long? At what point does a memorial become a nuisance? When should a city step in and clean it up? While my personal answer to such a question is “never,” unless it poses a safety hazard of some sort, the lack of firm rules often leads to police, or sanitation officials, or just a local resident or business taking down a memorial without notice. This leaves the family of the victims feeling angry and violated again. Sometimes a memorial goes back up. Sometimes it doesn’t. Councilmembers Mitch Englander and Joe Buscaino have written a motion calling on the city to create rules regarding the maintenance and removal of memorials. Current law orders the Bureau of Sanitation to remove “all items blocking the public right-of-way.” In New York City, a 2010 law allowing the removal of “derelict” bicycles was amended to all “ghost bikes” to stay up, so there is precedent for major cities to enact memorial friendly legislation. A common time frame for removal is “90 days” in other cities. Tempe, Arizona has such an ordinance, but the memorials often last much longer. But when San Diego removed the ghost bike dedicated to a popular activist nearly half-a-year after the memorial was created, the community reacted with outrage. Sometimes even half a year isn’t enough time to say goodbye, or to remove a memorial that doubles as a piece of traffic calming. While neither office has gone “on the record” on this motion, casual conversation with staff confirms that the goal is to create a consistent and predictable policy that leans towards leaving such memorials up for longer periods of time. There are lots of Flickr sets from the 2009 die-in at Castillo’s at the Ghost Bike. This picture is from Alex Thompson’s but there are also good ones at Ensie’s and Streetsblog’s. It should be noted that Councilmember Buscaino’s staff includes John Jones III, one of the founders of the Eastside Riders. 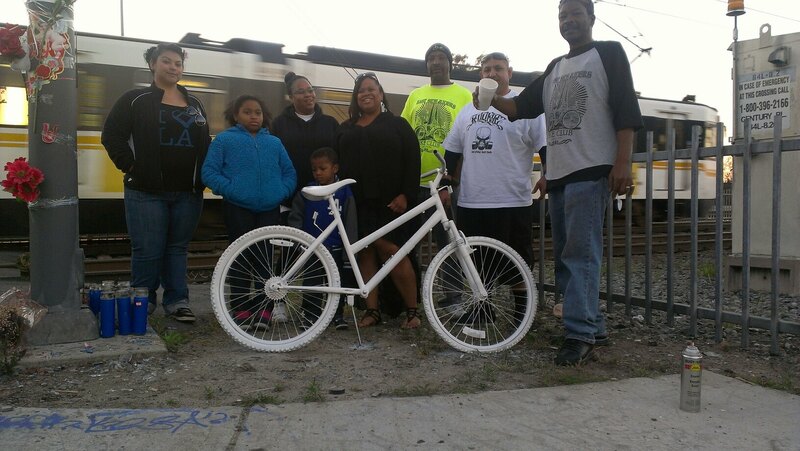 Eastside Riders is one of the groups that helps create Ghost Bike memorials. So if we take the Councilmembers’ motion at face value, what would you like a final set of regulations to look like? Leave thoughts in the comments section. I’ll leave some of mine there as well. It is Englander not O’Farrell. Terrible reporting. contemporary safety measures to effectively prevent all future tragedies. Yikes. That is a pretty egregious error. My apologies and it’s been corrected. I think you meant to say Englander once again. I’m not sure the correction was made the way you intended. good catch. it was 2013. i’ll make the change. Two New Ghost Bikes Go Up to Honor Fallen Cyclists in South L.A.